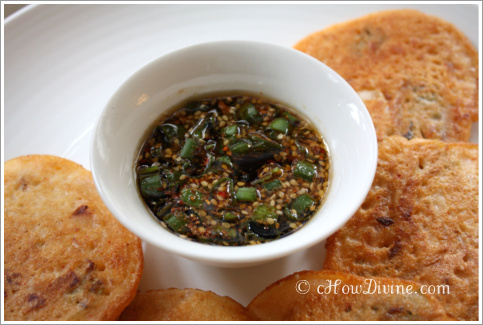 Nokdu Bindaetteok (Korean Mung Bean Pancakes) is my maternal grandmother’s specialty. Nokdu Bindaetteok, which directly translates to Mung Bean Pancake, is usually made with sliced pork, kimchi, sukju namul (mung bean sprouts), and sometimes gosari namul (bracken fern shoots). 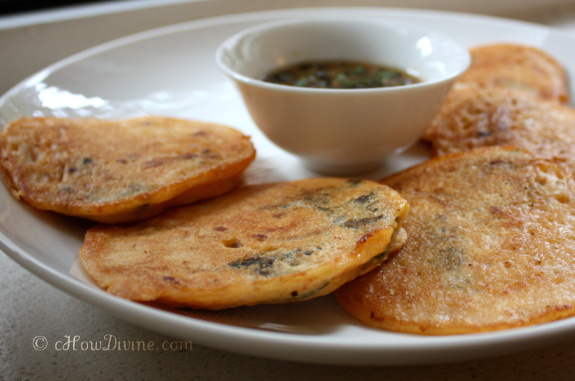 But I’m omitting the pork for this Nokdu Bindaetteok/Mung Bean Pancake recipe, making this dish vegan. And for the base of the batter? Simply, soaked mung beans and rice. Flour-free. Gluten-free. Dairy-free. Just delicious goodness. Keep in mind; when you dine at a restaurant, mung bean pancakes are not necessarily gluten-free unless specifically stated. Restaurants can add different types of flour to the batter – not a good thing. Additionally, dipping sauces can contain gluten. So always ask. Don’t assume. Note: Try to get peeled dried mung beans. Peeled mung beans are yellow in color. They are generally available in Korean markets and some Whole Foods Markets. I used green mung beans with skin still intact. Taking the skin off is a tedious task. Save yourself the trouble. If possible, get the already peeled beans. 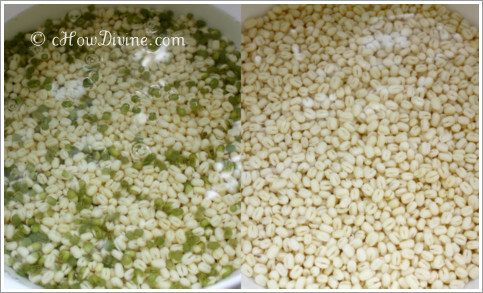 Wash and soak nokdu (mung beans) and brown sweet rice in water until they soften, about 8-10+ hours. Rinse the beans and rice, and change the water a few times. If you are using green mung beans with skin still intact, soak the mung beans and rice separately; this will make it easier to remove the skin. Rub the beans together to remove the skin. Once the mung beans have softened, the beans should easily pop out of the skin; and the skin should float to the top. Discard the skin. Drain. Parboil sukju namul (mung bean sprouts). 2-3 minutes should suffice. Rinse the parboiled mung bean sprouts with cold water and drain. 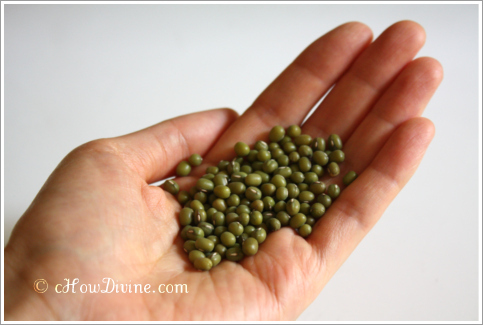 Once drained, squeeze out excess water from the mung bean sprouts using your hands. Discard excess water you’ve squeezed out. Add ½ tsp salt, 1 tsp sesame oil, 1 tsp sesame seed to the mung bean sprouts. Mix well. Set aside. 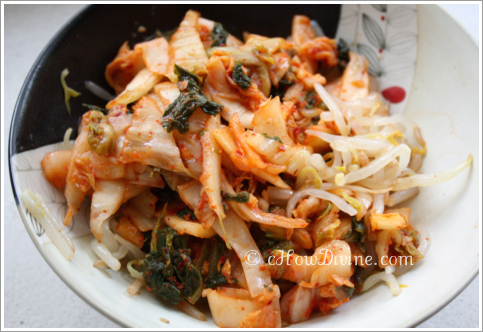 Chop cabbage kimchi. Add chopped kimchi to the seasoned mung bean sprouts. Mix. Set aside. Process the drained beans and rice in a blender with ½-¾ cup water. 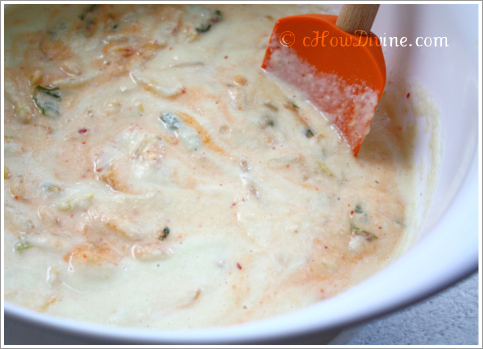 The batter should not be smooth; it should be coarse in texture. Add 1 tsp salt. Fold in kimchi and sukju namul mixture. Mix Gently. Heat a pan on medium heat. Add oil to pan. Swirl to coat the pan. Add 3-4 TBs (about ¼ cup) of batter to make 4-inch pancakes. Flip when golden brown on bottom. Heat for another 2-3 minutes on the other side. Serve immediately with soy-scallion dipping sauce. Combine all ingredients in a small bowl. Mix well. Serve with hot Bindaetteok. Your blog has exactly the same post as another author but i like your better. Exact same posting? Hmm… Do you happen to remember where? I hope this helps. If you have other questions, don’t hesitate to ask. Thank you Swasti! Hope you enjoy it!